The saying “ your hair is your crowning glory” has been on repeat in my head since I was seven. It was my mother’s way of reminding me to brush my hair every night. And as I was growing up, I learned to experiment on my hair and it always amazes me how one simple hairstyle magically transforms my over-all look. The comfort and sophistication updo hairstyles bring are few of the reasons why it has become my all-time favorite. 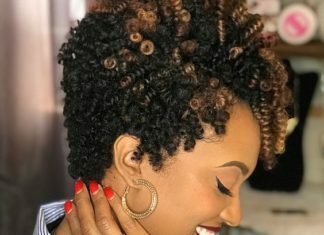 Here are 20 black updo hairstyles that work for me, and would most likely work for you too! If you’re looking for aimple Natural hair updos, why not try the messy bun? 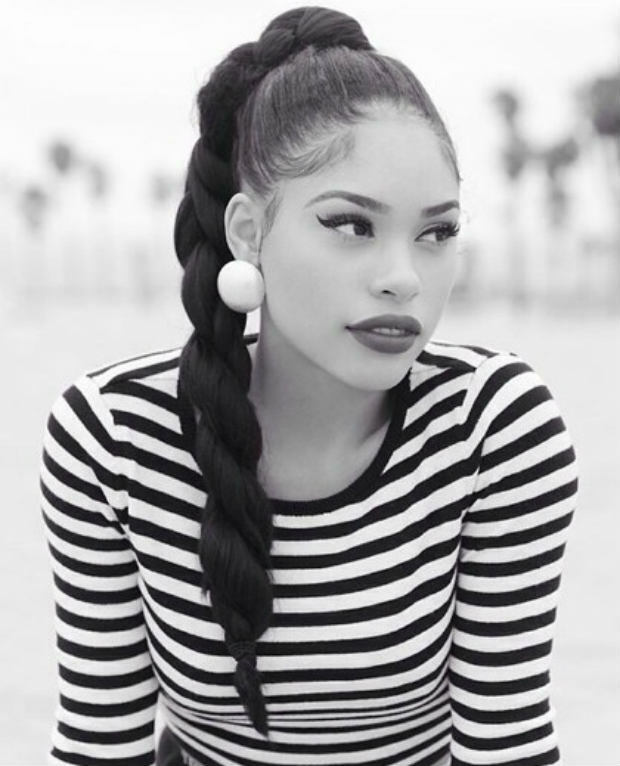 This french bun is at the top of our list and who doesn’t love this updo hairstyle? 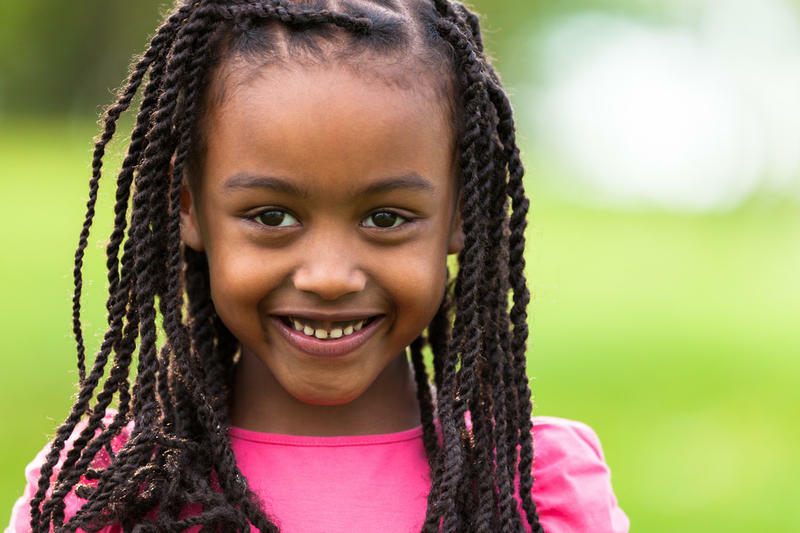 It’s the hairstyle that shouts “carefree”! A simple messy bun is all you need to elevate that boring ‘do to the next level. And the best part — you don’t even need a comb to pull off this look. I call this the “to-go-to-hairstyle”. This comes in handy when I need a bit of concentration. You know how they say: when a woman ties her hair, she means serious business? 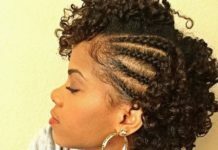 This is the undo hairstyle for concentration. Whether I’m studying or simply preparing food in the kitchen, tying my hair up in a classic ponytail simply makes me work a lot more comfortably. I am pretty sure all the other women can totally relate to this. Now for those who want to remain comfortable in parties or events, you can always raise the notch to a higher level. One of Hollywood’s favorite undo hairstyles of all time – the high fashion pony. It reflects elegance without compromising comfort and sophistication. 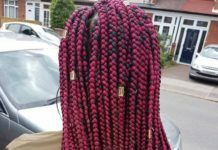 Imagine the hairstyle you use when cleaning your toilet but just a bit more polished and sleek this time. I say on-point! Let the party begin! Braids plus ponytail? That’s just about two of my favorite things as a little girl; and yes, this updo hairstyle definitely reminds me of my childhood. Every time I put on this style, I somehow automatically feel beautiful and oh so girly. I say this style is perfect of a laid-back kind of day when you just want to hit the movies or read your favorite book for the fifth time in a nearby coffee shop. 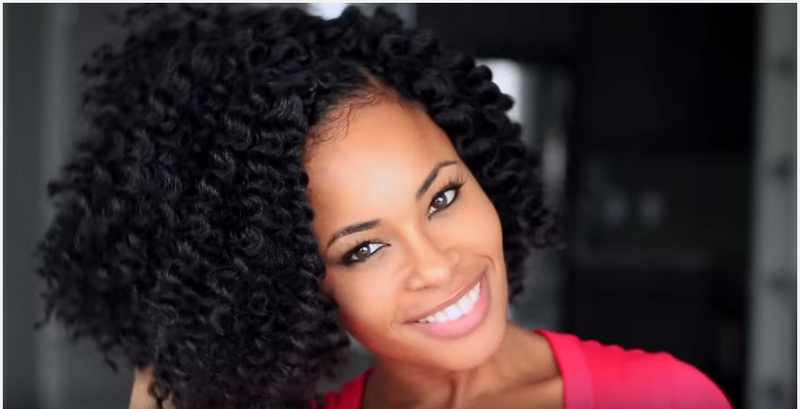 Fret not my ladies with curly hair, updo hairstyles perfectly work for you too! See how Janet Jackson pulled off this look? I say it’s pretty neat, isn’t it? Same steps in completing the messy bun with a just a couple of emphasis on the curls this time. If you have straight hair and you like to pull off this style, simply use a curling iron before bringing your hair up for a bun. Before you even think of doing this, I suggest you consider the shape of your face. While most women think they can pull off a full-fringe ‘do, sadly, it only works well for a few. Fringes work best for women with oval shaped faces. The look is quite easy, simple create knots and bring them to a really high updo and trim your fringe to full! The fringe gives emphasis to the shape of your face and it similarly highlights your eye make up. 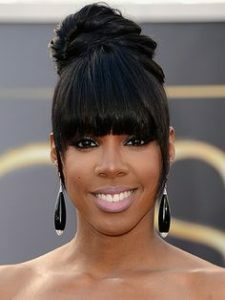 See how Kelly rocked this updo hairstyle! 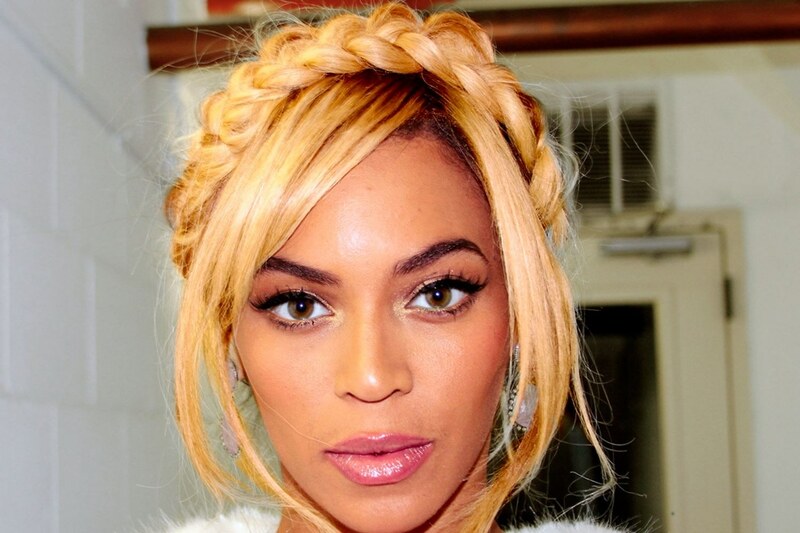 Even with her brows unexposed, the amount of hair volume she displays is enough to spell b-e-a-u-t-i-f-u-l! 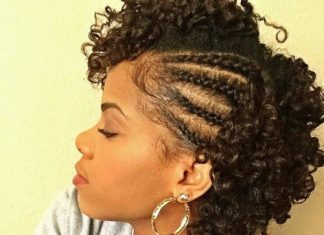 This updo hairstyle sounds just like a menu to me. I find everything girly in this style. Perfect for any party or simply when just when you wanted to feel youthful. 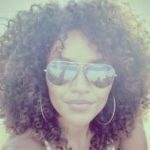 This is a combination of three classic techniques that I believe most women have experimented on. Are you brave enough to bring all three together? When you want your hair out of the way and put the spotlight on your beautiful face while retaining the feminine vibe with some hair on the lose; this one’s for you. Some call it the half-moon style. This is combining a ponytail and a hair-down kind of ‘do. 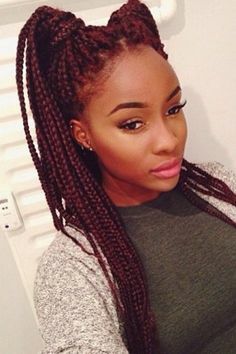 If you want to pull off that Sansa Stark from the Game of Thrones series kind of look, this is the hairstyle for you! Princess Elsa and Anna perfectly pulled off this ‘do too! There’s no reason why you can’t. This is best for parties, awards night (if you have one to attend to) or even just a feel-good day. The Sleek Princess Bun is true to its name as it certainly makes you feel like a true princess. I love women with natural curly and puffy locks. 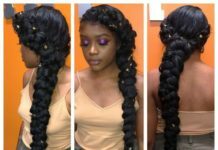 While many women nowadays go for artificial hair straightening, those who are truly proud of their roots surely carry their natural puffy locks with poise and elegance. 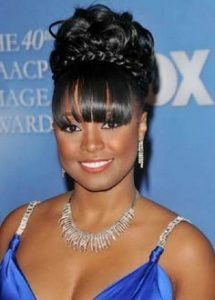 This updo hairstyle is best achieved with embellishment: jewels, headbands, ribbons and the like. If you’re one with natural puffy hair, I say wear it proud! Who says only Hollywood stars and supermodels can pull off the ever-famous topknot updo? All it takes for one woman to give this hairstyle justice is confidence and a lot of hair! 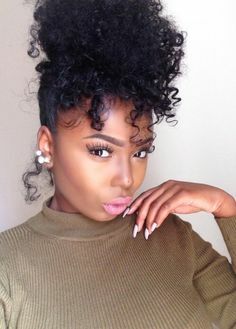 All you need to do is pull up your hair to the highest point of your head, hence the name “top”, then create a beautiful bun. This spells effortless updo hairstyle. All you need is heavy and well polished and detailed make up to balance the messy hairdo. This is best for night outs and party with friends. 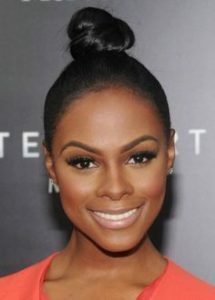 This updo hairstyle is also famous among younger women who think messy is the new sleek! 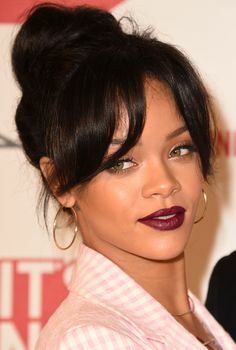 No wonder young ladies loved this ‘do so much; Rihanna has perfected it herself! Way to go! For ultra-modern women with elegance encrypted in their DNA, this highly esteemed hairstyle is the way to go. 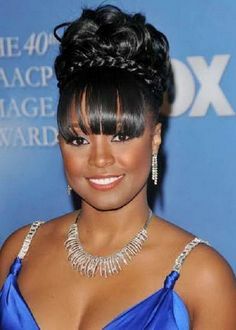 Much like any other hairstyles that involve fringes, make sure the shape of your face supports the fringe you want to rock. Ashanti superbly rocked this ‘do. Two thumbs up. If you think you’ll find it rather challenging to pull off the full bangs or fringe, the side bangs is the solution for you. Instead of going for a bolder attempt of having a full fringe, why not take it slow and go for a side fringe or bangs; same effect, but less risky. 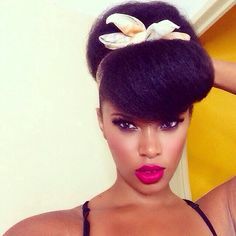 Simply blew out your hair, roll and pin it in place. Blowing your hair gives it full volume for the shape. Looks difficult to pull-off but with the right blowing and amount of hair you may just be able to flawlessly wear it like Janelle. 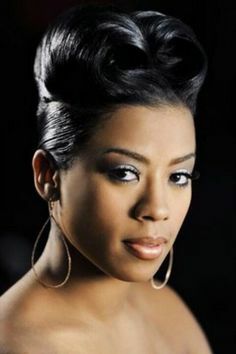 This updo has a resemblance with that of French roll updo and you can also combine this with a ponytail. To complete a perfect look, you may want to emphasize your eye make up or add a cute head wrap. The secret to achieving this attention-grabbing updo is your magnificently healthy hair. Pulling your hair or half up to a very high ponytail and then parting them curls and bringing them to the front. Simple, yet elegant. Perfect for parties or night outs with friends. It’s stunning how you can actually put all the style together and achieve a Hollywood kind of hairstyle. 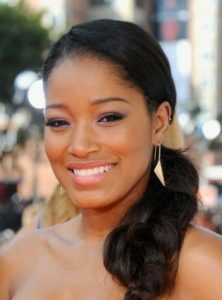 This one involves a side-swept fringe, a simple ponytail with a volume on the middle part which is usually achieved by blow drying and combing techniques. While this can be a premiere night kind of hairstyle, I can picture myself wearing just a white tee, distressed jeans and this! LOVE this look! 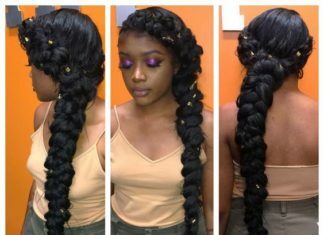 Whenever I see this curled and twisted locks updo hairstyle, all I can say is Chic, Edgy, Funky! Ah! 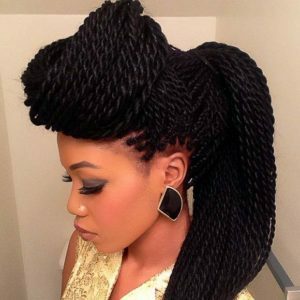 Whether the braided locks are coiled and twisted into an asymmetrical ‘do or are gathered to a huge bun, this look is hot and fierce! Remember the high ponytail updo? this time we add 2 braided ponytails. We can let the hair down instead or we can finish it in to form 2 braided buns. This girl exuded the look flawlessly here.